"Hey kids! Wanna explore travel through movies filmed in Europe?!" You can be the hero, mom or dad, when you accomplish both travel exploration AND obsession fulfillment by recommending Star Wars: Episode II - Attack of the Clones , filmed in part in Italy and Andalucía, Spain, for family movie night. Tunisia gets the most frequent mention by the films' scenery fans for the unusual barren landscapes of Luke and Anakin Skywalker's home planet, Tatooine, but this Attack of the Clones episode includes many scenes filmed on the gorgeous shores of Lake Como in Italy. 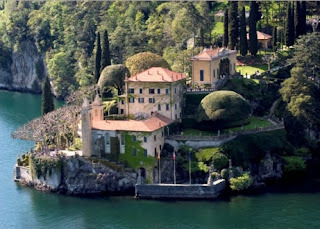 Padmé Amidala's (Natalie Portman) terraced garden retreat where she and Anakin (Hayden Christensen) hide out and get married is the 16th century Villa Arconati Visconti del Balbianello in the town of Lenno overlooking the mountains and waters of Lake Como. Padmé's palace on her home world of Naboo is actually the Royal Palace of Caserta in southern Italy near Naples, an enormous royal residence inspired by the Palace of Versailles. Some changes were made to the structure with computer graphics, but the visuals are splendid. Other scenes on Naboo were filmed at the Plaza de España in Seville, Spain, the semicircular arched gallery where Padmé, Anakin, and R2D2 take a walk. I doubt anyone needs a plot summary here of the Star Wars saga, nor a link to the trailer, so - if you don't (gasp!) own the prequel and sequel trilogies - rent it or queue it up on the DVR and enjoy the adventure. Hi! Thank you so much for following Avalon Cat Cartoons. I LOVE your blog and am following you back. I can feel that I will return often ;-) Have a lucky week! P.S. I'm from Belgium, so let me know if you ever need any tips. As a Star Wars geek, I HAD to read about this one - who would have thought Lake Como. I love that scene in the movie where Padme is looking out over the lake - well, I really love the dress. But the scenery is beautiful, I should have known it was Lake Como... such a gorgeous area.